Editorial: Does Disruptive Innovation Enhance Our Paradigm Shifts? Thematic Abstract Review: Zirconia Oral Implants - Do We Have Scientific Documentation for General Clinical Use? Purpose: To assess the effect of airborne particle abrasion of metal implant abutments on tensile bond strength (TBS) of TempBond, Retrieve, and Premier implant cements. Materials and Methods: Specimens were designed to replicate a single metal implant crown cemented to both smooth and airborne particle- abraded Osteo-Ti implant abutments with zero degrees of taper. Twenty castings were fabricated and cemented to either a smooth surface abutment (SSA) or to an airborne particle-abraded abutment (AAA). TBS was measured with a 50-kg load and a crosshead speed of 0.5 cm/min in a universal testing machine. Each cement was tested 10 times on both abutment types. Results: The mean TBS values (standard deviations, 95% confidence intervals) of SSAs for TempBond, Retrieve, and Premier cements were 115.89 N (26.44, 96.98-134.81), 134.43 N (36.95, 108.25-160.60), and 132.51 N (55.10, 93.09-171.93), respectively. The corresponding values for AAAs were 129.69 N (30.39, 107.95-151.43), 298.67 N (80.36, 241.19-356.16), and 361.17 N (133.23, 265.86-456.48), respectively. There was no significant difference in TBS among the dental cements when used with an SSA. Air abrasion of abutments did not increase the TBS of TempBond but significantly increased crown retention with Retrieve and Premier. For SSAs, all failures were adhesive on the abutment surface; for AAAs, mostly cohesive cement failures occurred. Conclusion: The retention of copings cemented with Retrieve or Premier to zero-degree-taper abutments was significantly increased after airborne particle abrasion of the abutments. However, this was not significant when TempBond was used. Airborne particle abrasion of abutments and the use of Retrieve or Premier can be recommended for nonretrievable prostheses. Although TempBond functioned similarly to the two other cements in SSAs, it is advisable to limit its use to provisional prostheses; its long-term performance needs to be assessed clinically. Purpose: The aim of this study was to measure and compare, using scanning electron microscopy, the abutment-implant interface of a Morse taper system before and after cyclic loading. Materials and Methods: Four Morse cone implants and four solid abutments were used. These abutments had been machined to reduce the diameter of the part corresponding to the site of prosthesis cementation. They were then screwed onto the implants and torqued to 25 N. Under a scanning electron microscope, 32 images (16 before and 16 after cycling) of the interfaces were obtained under ×1,000 and ×5,000 magnification. The samples were subjected to 345,600 cycles with a fatigue testing machine, in which the applied load was 80 N and the frequency was 4 Hz, to simulate chewing. With appropriate software (Image Tool 3.0), the marginal gaps of the interfaces before and after load cycling were measured. The data were analyzed with the Student t test at a significance level of 5%. Results: Significant differences were found between interfaces before and after cycling. Prior to mechanical cycling, the Morse taper implant/abutment assemblies exhibited an average gap size of 3.34 ± 2.17 μm, whereas the average gap size after mechanical cycling was 1.35 ± 0.64 μm. Conclusion: After mechanical cycling, there was a significant decrease in the size of the gap, which indicated better adaptation and sealing ability at the level of the microgap. 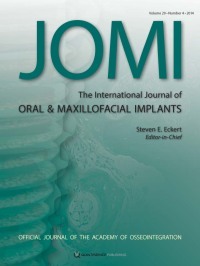 Purpose: This study aimed to develop and evaluate experimentally an implant-based registration method for measuring three-dimensional (3D) kinematics of the mandible and dental implants in the mandible based on dental cone beam computed tomography (CBCT), modified to include fluoroscopic function. Materials and Methods: The proposed implant-based registration method was based on the registration of CBCT data of implants/bones with single-plane fluoroscopy images. Seven registration conditions that included one to three implants were evaluated experimentally for their performance in a cadaveric porcine head model. Results: The implant-based registration method was shown to have measurement errors (SD) of less than -0.2 (0.3) mm, 1.1 (2.2) mm, and 0.7 degrees (1.3 degrees) for the in-plane translation, out-ofplane translation, and all angular components, respectively, regardless of the number of implants used. The corresponding errors were reduced to less than -0.1 (0.1) mm, -0.3 (1.7) mm, and 0.5 degree (0.4 degree) when three implants were used. Conclusion: An implant-based registration method was developed to measure the 3D kinematics of the mandible/implants. With its high accuracy and reliability, the new method will be useful for measuring the 3D motion of the bones/implants for relevant applications. Purpose: This in vitro study evaluated the accuracy of three different impression techniques, using polyether impression material, to obtain a precise definitive cast for a multiple-unit implant restoration with internal- or external-connection implants. Materials and Methods: Two reference resin models, one with four internalconnection implants (RRMI) and one with four external-connection implants (RRME), were fabricated. The longitudinal axes of all implants diverged by 15 to 20 degrees from the midline toward the labial/buccal. Six groups of 15 specimens each (45 RRMI, 45 RRME) were made with medium-consistency polyether: nonmodified square impression copings (NMIC and NMEC groups), square impression copings joined together with autopolymerizing acrylic resin before the impression procedure (RIC and REC groups), and square impression copings that were airborne particle-abraded and coated with impression adhesive (MIC and MEC groups). A single calibrated examiner evaluated the positional accuracy of the implant replica heads with a profile projector. These measurements were compared to the measurements calculated on the RRMI and RRME, which served as controls. All differences between the distances measured on the RRMI and on the RRME and those measured on the definitive casts of the six groups were transformed into the differences in microns each 1,000 μm of length (per mil difference) and statistically analyzed. Results: Considering anterior and posterior per mil median differences together, the highest precision of the definitive casts was in the groups MEC, REC, and RIC. Conclusion: Within the limitations of this study, splinted square impression copings (RIC and REC) and airborne particle-abraded and coated (MIC and MEC) impression techniques showed greater accuracy in replicating the control models (RRMI and RRME) than the nonmodified technique (NMIC and NMEC). The definitive casts of the model with internal-connection implants achieved the highest precision with splinted square impression copings (RIC). Purpose: To evaluate and compare the influence of continuous and intermittent forces on stability of titanium microscrews. Materials and Methods: One hundred forty-four microscrews were inserted bilaterally in the intraradicular zones of the maxillary first molar and second premolar in 36 beagles. Loads were delivered consecutively in the continuous group (n = 12), in cycles of 12 hours on/paused for 12 hours in intermittent group A (n = 12), and in cycles of 24 hours on/paused for 24 hours in intermittent group B (n = 12). The on/ off cycles were repeated for 1, 3, 5, or 7 weeks, after which the animals were sacrificed, and microcomputed tomography (micro-CT) and pull-out testing were performed. Results: The micro-CT parameters of the microscrews in all three groups increased gradually with loading time. The value of peak load at extraction (Fmax) increased and reached a peak at week 5 but dropped slightly at week 7. In the continuous group, all measurements were lower than those in the intermittent groups at all times examined. All values in intermittent group A were higher than those in intermittent group B. Conclusion: An intermittent loading regimen appears to be more favorable for obtaining stability than continuous loading, and a 12-hour/12-hour on/off loading cycle is superior to a 24-hour/24-hour on/off protocol in promoting bone-implant contact. Purpose: The objective of this study was to evaluate the optimal thickness and porosity of novel titanium mesh membranes to enhance bone augmentation, prevent soft tissue ingrowth, and prevent membrane exposure. Materials and Methods: Six types of novel titanium meshes with different thicknesses and pore sizes, along with three commercially available membranes, were used to cover surgically created calvarial defects in 6-week-old Sprague-Dawley rats. The animals were killed after 4 or 8 weeks. Microcomputed tomographic analyses were performed to analyze the three-dimensional bone volume and bone mineral density. Soft tissue ingrowth was also evaluated histologically and histomorphometrically. Results: The novel titanium membranes used in this study were as effective at augmenting bone in the rat calvarial defect model as the commercially available membranes. The greatest bone volume was observed on 100-μm-thick membranes with larger pores, although these membranes promoted growth of bone with lower mineral density. Soft tissue ingrowth when 100-μm membranes were used was increased at 4 weeks but decreased again by 8 weeks to a level not statistically significantly different from other membranes. Conclusion: Membrane thickness affects the total amount of new bone formation, and membrane porosity is an essential factor for guided bone regeneration, especially during the initial healing period, although the final bone volume obtained is essentially the same. Newly developed titanium mesh membranes of 100 μm in thickness and with large pores appear to be optimal for guided bone regeneration. Purpose: To compare the accuracy of digital and conventional impression techniques for partially and completely edentulous patients and to determine the effect of different variables on the accuracy outcomes. Materials and Methods: An electronic and manual search was conducted to identify studies reporting on the accuracy of implant impressions. Pooled data were descriptively analyzed. Factors affecting the accuracy were identified, and their impact on accuracy outcomes was assessed. Results: The 76 studies that fulfilled the inclusion criteria featured 4 clinical studies and 72 in vitro studies. Studies were grouped according to edentulism; 41 reported on completely edentulous and 35 on partially edentulous patients. For completely edentulous patients, most in vitro studies and all three clinical studies demonstrated better accuracy with the splinted vs the nonsplinted technique (15 studies, splint; 1, nonsplint; 9, no difference). One clinical study and half of the in vitro studies reported better accuracy with the open-tray vs the closed-tray technique (10 studies, open-tray; 1, closed-tray; 10, no difference). For partially edentulous patients, one clinical study and most in vitro studies showed better accuracy with the splinted vs the nonsplinted technique (8 studies, splint; 2, nonsplint; 3, no difference). The majority of in vitro studies showed better accuracy with the open-tray vs the closed-tray technique (10 studies, open-tray; 1, closed-tray; 7, no difference), but the only clinical study reported no difference. Conclusion: The splinted impression technique is more accurate for both partially and completely edentulous patients. The open-tray technique is more accurate than the closed-tray for completely edentulous patients, but for partially edentulous patients there seems to be no difference. The impression material (polyether or polyvinylsiloxane) has no effect on the accuracy. The implant angulation affects the accuracy of implant impressions, while there are insufficient studies for the effect of implant connection type. Further accuracy studies are needed regarding digital implant impressions. Purpose: To measure the horizontal machining tolerances of the interface between internal- and externalhexagon implants and analogs with corresponding components after delivery from the manufacturer. These values may be a valuable tool for evaluating increasing misfit caused by fabrication, processing, and wear. Materials and Methods: Seven implants and seven analogs with external- and internal-hexagon connections (Biomet 3i) with corresponding prefabricated gold cylinders and gold screws, prefabricated cylindric plastic cylinders, and laboratory screws were studied. One set of components from the external and internal groups was measured manually and digitally. Measurements from the test subjects were compared with identical measurements from the virtual model to obtain threshold values. The virtual model was then used to obtain optimally oriented cuts. Results: The horizontal machining tolerances for castable plastic abutments on external implants were 12 ± 89 μm, and for internal implants they were 86 ± 47 μm. Tolerance measurements on prefabricated gold abutments for external implants were 44 ± 9 μm, and for internal implants they were 58 ± 28 μm. Conclusion: The groups with metallic components showed the smallest tolerance at < 50 μm for the external group and < 90 μm for the internal group. The prefabricated plastic cylinder groups ranged from < 100 μm for external and < 130 μm for internal connection. Purpose: To evaluate the accuracy of a digital impression system based on parallel confocal red laser technology, taking into consideration clinical parameters such as operator experience and angulation and depth of implants. Materials and Methods: A maxillary master model with six implants (located bilaterally in the second molar, second premolar, and lateral incisor positions) was fitted with six polyether ether ketone scan bodies. One second premolar implant was placed with 30 degrees of mesial angulation; the opposite implant was positioned with 30 degrees of distal angulation. The lateral incisor implants were placed 2 or 4 mm subgingivally. Two experienced and two inexperienced operators performed intraoral scanning. Five different interimplant distances were then measured. The files obtained from the scans were imported with reverseengineering software. Measurements were then made with a coordinate measurement machine, with values from the master model used as reference values. The deviations from the actual values were then calculated. The differences between experienced and inexperienced operators and the effects of different implant angulations and depths were compared statistically. Results: Overall, operator 3 obtained significantly less accurate results. The angulated implants did not significantly influence accuracy compared to the parallel implants. Differences were found in the amount of error in the different quadrants. The second scanned quadrant had significantly worse results than the first scanned quadrant. Impressions of the implants placed at the tissue level were less accurate than implants placed 2 and 4 mm subgingivally. Conclusions: The operator affected the accuracy of measurements, but the performance of the operator was not necessarily dependent on experience. Angulated implants did not decrease the accuracy of the digital impression system tested. The scanned distance affected the predictability of the accuracy of the scanner, and the error increased with the increased length of the scanned section. Crespi, Roberto / Capparè, Paolo / Gherlone, Enrico F.
Purpose: The aim of this study was to assess buccal bone plate recontouring in maxillary fresh extraction sockets with buccal bone loss using cone beam computed tomography (CBCT). Materials and Methods: Healthy patients who required the extraction of one tooth with buccal bone loss in the maxilla were included in this study. CBCT examinations were made before extractions and after 3 months. The alveolar bone levels were assessed from the most coronal, buccal, and palatal bone in which the crest was identified. Buccolingual width at the apical and coronal level was also measured. Results: Fifty healthy patients underwent 50 extractions. Mean bone levels for both single-rooted and multiple-rooted teeth, from a buccopalatal perspective, showed no statistically significant difference between preextraction status and 3 months later. However, in both groups, mean bone levels of the buccal bone plate showed statistically significant differences between extraction and 3 months later. In single-rooted teeth, a mean bone gain of 5.36 ± 2.65 mm was seen after 3 months, and for multiple-rooted teeth, a mean bone gain of 5.89 ± 2.88 mm was seen. Growth in buccolingual width was seen; nevertheless, volume dimensional changes were reported after tooth extraction. Conclusions: In the first months after extraction, it is possible to observe the formation of buccal bone in sockets with previous buccal bone loss. Purpose: Because there is a paucity of clear-cut evidence regarding which materials and techniques are most accurate for complete-arch, multiple-implant impressions, the current study sought to analyze the data and draw useful conclusions based on the evidence for application in clinical practice. Materials and Methods: Relevant studies published between 1990 and December 2012 were included in the review. The articles were located through PubMed and manually through reviewing references in the literature. Papers examining implant impression accuracy in completely edentulous arches (three or more implants) were included. Clinical case reports, technique articles, abstracts, and review papers were excluded. Results: One of the 34 studies selected for evaluation was clinical; the remaining 33 were in vitro investigations. Ten studies compared polyvinyl siloxane (PVS) and polyether (PE); eight found that these were statistically equal in terms of impression accuracy. The splint effect was examined by 24 studies; 10 failed to observe any differences between splinted and nonsplinted impressions, whereas 7 (> 25%) showed that the splinted technique was better than the nonsplinted technique. Thirteen studies investigated the differences between pickup and transfer impression techniques; six favored pickup over transfer, and five found insignificant differences between the techniques. The effect of nonparallel implants on edentulous multiple-implant impression accuracy was examined by only two studies. Significant differences in accuracy were observed for 15 degrees of angulation. Conclusion: Most of the evidence supports PVS and PE as the most accurate impression materials for edentulous multiple-implant situations, with no clear advantage of either. Conflicting evidence exists regarding the most accurate impression technique (splinted/nonsplinted, pickup/transfer), and no clear recommendation can be made. Inadequate research exists regarding several other factors that might affect edentulous implant impression accuracy. There is a lack of clinical research to support in vitro findings. Purpose: The objective of this study was to systematically review the available literature on three-dimensional time-dependent graft volume changes after sinus augmentation (SA) with different biomaterials in humans. Materials and Methods: MEDLINE, EMBASE, and CENTRAL were searched for related literature. Controlled and uncontrolled studies reporting volume changes of more than 10 SAs after at least 6 months, assessed by computed tomography (CT) or cone beam CT (CBCT), were eligible for inclusion. The primary outcome of interest was time-dependent percentage change in augmentation volume. Results: Seven controlled and five uncontrolled studies (n = 234 SAs) with a high risk of bias were included and reported on a range of graft materials. Autogenous bone (AB) was used in the particulate or block form. Bone substitutes (BS) were used either alone or in combination with other materials as composite grafts (CG). All studies reported reductions in augmentation volumes over time (AVR), generally after short observation periods (range, 6 months to 6 years). Substantial AVRs (approximately 45% in 77 SAs) were reported for AB after 6 months and up to 2 years. AVRs for solely BS or CG were relatively lower (approximately 18% to 22% in 142 SAs) after a similar time period. All studies reported a wide range of volume reductions. No significant differences in AVR were observed between different graft materials. Because of insufficient long-term data, a reliable association between volume reduction and time could not be established. Conclusion: Some loss of augmentation volume always occurs after SA during early healing times. In general, less AVR may be expected after SA with BS or CG compared to SA with AB. Augmentation volume loss does not seem to compromise implant placement or survival. Purpose: The configuration and degree of corticalization of bifid mandibular canals were examined using medical computed tomography (CT) images from 170 hemimandibles obtained from 308 Taiwanese adults. Materials and Methods: The configurations of the bifid canals were assessed according to their anatomical position in relation to the ramus, molars, premolars, and mental foramen; their course (anterior/posterior or superior/inferior); the presence or absence of confluence with the main mandibular canal; and the presence or absence of penetration through the mandible to form an accessory foramen. The percentage of the canal length that was corticalized was measured. Two different classifications of bifid canals were also briefly summarized and compared. Results: When bifid canals are present (41.2% of patients; 27.6% of hemimandibles), the bifid canals were primarily located in the ramus and retromolar regions (67.7%) running anteriorly (95.9%) and superiorly (95.9%) without confluence with the main mandibular canal (91.1%). Up to 16.5% of bifid canals form accessory foramina on the cortical surface of the mandible. Approximately 78% of the bifid canals have varied degrees of corticalization around the bifid canals. Conclusion: The configuration and course of 170 mandibular bifid canals were evaluated with CT images. The bifid canals were primarily located in the ramus and retromolar regions; however, 32.4% of the bifid canals were located in potential positions for dental implant placement. Most of the bifid canals ran anteriorly superior to the main mandibular canal, did not rejoin with the main mandibular canal, and diminished within the mandibular body. Approximately half of the bifid canals (45%) were completely corticated. Purpose: To evaluate and compare crestal bone level changes and peri-implant status of implant-supported reconstructions in edentulous and partially dentate patients after a minimum of 5 years of loading. Materials and Methods: All patients who received a self-tapping implant with a microstructured surface during the years 2003 and 2004 at the Department of Prosthodontics, University of Bern, were included in this study. The implant restorations comprised fixed and removable prostheses for partially and completely edentulous patients. Radiographs were taken immediately after surgery, at impression making, and 1 and 5 years after loading. Crestal bone level (BIC) was measured from the implant shoulder to the first bone contact, and changes were calculated over time (ΔBIC). The associations between pocket depth, bleeding on probing (BOP), and ΔBIC were assessed. Results: Sixty-one implants were placed in 20 patients (mean age, 62 ± 7 years). At the 5-year follow-up, 19 patients with 58 implants were available. Implant survival was 98.4% (one early failure; one patient died). The average ΔBIC between surgery and 5-year follow-up was 1.5 ± 0.9 mm and 1.1 ± 0.6 mm for edentulous and partially dentate patients, respectively. Most bone resorption (50%, 0.7 mm) occurred during the first 3 months (osseointegration) and within the first year of loading (21%, 0.3 mm). Mean annual bone loss during the 5 years of loading was < 0.12 mm. Mean pocket depth was 2.6 ± 0.7 mm. Seventeen percent of the implant sites displayed BOP; the frequency was significantly higher in women. None of the variables were significantly associated with crestal bone loss. Conclusion: Crestal bone loss after 5 years was within the normal range, without a significant difference between edentulous and partially dentate patients. In the short term, this implant system can be used successfully for various prosthetic indications. Purpose: To compare the efficacy of two different techniques for vertical bone regeneration at implant placement with particulate autogenous bone at 6 years after loading by means of a double-blind, superiority, parallel-group randomized clinical trial. Materials and Methods: The study was conducted in a private center in Italy between April 2004 and December 2011. Patients in whom vertical bone augmentation was indicated in combination with the placement of single or multiple implants were eligible for inclusion in this trial. Patients were randomized to receive either resorbable collagen barriers supported by an osteosynthesis plate (test group) or nonresorbable titanium-reinforced expanded polytetrafluoroethylene barriers (control group). The outcome variables-radiographic bone variation at implant sites, implant failures, and complications- were evaluated 6 years after loading. Randomization was done by computer, with allocation concealed by opaque sequentially numbered sealed envelopes. The patients and the radiographic examiner were blinded to group assignment. Results: Twenty-two patients were randomized: 11 to the resorbable barrier group and 11 to the nonresorbable (control) group. One control group patient dropped out. The mean bone level 6 years after surgery was 1.33 mm for the resorbable group and 1.00 mm for the nonresorbable group. The adjusted difference in bone changes between groups was 0.15 mm (95% confidence interval, -0.39 to 0.69, P = .5713). No implant failures or complications occurred after loading. Conclusion: No differences were observed in this comparison of resorbable and nonresorbable barriers with simultaneous implant placement for vertical ridge augmentation. Brüll, Felix / Winkelhoff, Arie Jan van / Cune, Marco S.
Purpose: To retrospectively evaluate the clinical performance of zirconia endosseous implants. Materials and Methods: Partially edentulous patients with adequate bone volume to fit yttria tetragonal zirconia polycrystal (Y-TZP) implants at least 3.5 mm wide and 8.0 mm long were included. Full-mouth probing pocket depth (PPDs) and percentage bleeding on probing (BOP) scores around teeth and implant(s) were assessed and compared. Marginal bone loss/gain relative to baseline was measured on intraoral radiographs, and the prevalence and quantities of seven periodontal bacteria were assessed around implants and teeth in the same patient. Results: Seventy-four consecutively treated patients with 121 zirconia implants (66 two-piece implants and 55 one-piece implants) were clinically evaluated after a mean observation period of 18 months. Three implants had failed and had been removed, for a cumulative implant survival rate of 96.5% (± 2.0%) after 3 years. The 118 surviving implants demonstrated healthy mucosal conditions, with low mean PPDs (1.8 ± 0.4 mm) and mean BOP scores (4.1% ± 4.2%). PPD and BOP were statistically significantly lower around implants than around teeth. BOP and PPD around implants and teeth were significantly correlated. Stable marginal bone levels were observed (mean bone loss of 0.1 ± 0.6 mm after 3 years). The frequency of isolation of all marker bacteria was similar at tooth and implant sites. Conclusion: Zirconia endosseous implants can achieve a 3-year implant survival rate in partially edentulous patients, similar to that of titanium implants, with healthy and stable soft and hard tissues. Purpose: To define the role played by a suspended external-internal (SEI) suture in reducing marginal flap tension after bone augmentation in the maxilla and in enhancing primary wound healing. Materials and Methods: Twenty partially edentulous patients requiring bone augmentation (either guided bone regeneration or autogenous bone block placement) before or simultaneous with implant insertion in the maxilla were enrolled in this clinical prospective cohort study. Flap tension was measured by a dynamometer, which was accurate to within 1 g. The force recorded was that needed to enable the vestibular extensible flap to reach the edge of the palatal nonextensible flap. Flap tension was recorded after the periosteum-releasing incision was made (before application of any suture; T1), and after the SEI suture was applied (T2). Final marginal flap adaptation was accomplished via horizontal mattress sutures and simple stitches. Wound healing was monitored at 1, 2, 4, and 16 weeks and classified as "obtained primary closure" or "compromised" as a result of dehiscence or marginal flap necrosis. Results: The mean flap tension measured at T1 was 32.9 ± 7.7 g. After the SEI suture was applied, the mean marginal flap tension decreased to 4.1 ± 1.5 g. The marginal flap tension was reduced by 87.6% compared to the initial strain. All patients healed uneventfully, and no complications such as dehiscences or marginal flap necrosis were recorded. Conclusion: The application of the SEI suture reduced the tension on the margins of the flaps and played a decisive role in obtaining primary wound healing. In case of passive wound closure (strain < 5 g), the type of augmentation procedure (guided bone regeneration or autogenous block) was revealed to have no impact on the quality of wound healing. Ng, Simon D. / Tan, Keson B. / Teoh, K. H. / Cheng, Ansgar C. / Nicholls, Jack I. Purpose: This study examined the three-dimensional (3D) accuracy of the Encode Impression System (EN) in transferring the locations of two implants from master models to test models and compared this to the direct impression (DI) technique. The effect of interimplant angulation on the 3D accuracy of both impression techniques was also evaluated. Materials and Methods: Seven sectional polymethyl methacrylate mandibular arch master models were fabricated with implants in the first premolar and first molar positions. The implants were placed parallel to each other or angulated mesiodistally or buccolingually with total divergent angles of 10, 20, or 30 degrees. Each master model was secured onto an aluminum block containing a gauge block, which defined the local coordinate references. Encode healing abutments were attached to the implants before impressions were made for the EN test models; pickup impression copings were attached for the DI test models. For the seven test groups of each impression technique, a total of 70 test models were fabricated (n = 5). The EN test models were sent to Biomet 3i for implant analog placement. The centroid of each implant or implant analog and the angular orientation of the long axis relative to the x- and y-axes were measured with a coordinate measuring machine. Statistical analyses were performed. Results: Impression technique had a significant effect on y distortion, global linear distortion, and absolute xz and yz angular distortions. Interimplant angulation had significant effects on x and y distortions. However, neither impression technique nor interimplant angulation had a significant effect on z distortion. Conclusions: Distortions were observed with both impression techniques. However, the results suggest that EN was less accurate than DI. Purpose: The main aim of this study was to investigate the loss of maxillary teeth opposing mandibular implant-supported prostheses (ISPs) placed at dental clinics. Materials and Methods: Participating dentists were asked to provide information on implant procedures they had undertaken between January 1, 1990, and December 31, 2009. Data were requested for procedures in which implants were inserted into only one side of the mandible in posterior regions and no implants were inserted in other regions. Results: Data on a total of 383 patients were analyzed. Participants in this study consisted of 170 men and 213 women ranging from 20 to 78 years of age (mean age, 51.0 years). Natural teeth were divided into three groups: opposing teeth (teeth opposing ISPs), control teeth (teeth of the same type as the opposing teeth but on the other side of the maxilla), and other teeth. The mean observation period was 72 months. One hundred six teeth were lost during the observation period. Fourteen opposing teeth were lost (1.72%, 14/816), 15 control teeth were lost (1.84%, 15/816), and 77 other teeth were lost (0.98%, 77/7,891). The percentage of opposing teeth lost was significantly higher than that of other teeth. However, there was no difference in the rates of loss of opposing and control teeth. Conclusion: ISPs in posterior mandibular regions are not a risk factor for the loss of opposing teeth. Purpose: The placement of self-tapping implants is associated with microfractures and the formation of bone chips along the cutting flutes. This study was conducted to investigate the effect of different cutting edge angles on chip formation during the machining of trabecular and cortical bone using instruments with a rough titanium surface. Materials and Methods: Mandibular cortical and trabecular bone specimens were obtained from freshly slaughtered domestic pigs. A predefined thrust force was applied to the specimens. Four specially designed cutting instruments that simulated dental implants and had a rough titanium surface were allowed to complete one full revolution at cutting edge angles of 55, 65, 75, and 85 degrees, respectively. Torque and thrust were measured during the cutting process. Bone chips were measured and weighed under a microscope. Results: Different cutting edge angles did not lead to significant differences in torque. The lowest torque values were measured when the cutting edges were positioned at 65 degrees in trabecular bone and at 85 degrees in cortical bone. Bone chips were significantly larger and heavier at angles of 55 and 65 degrees than at angles of 75 and 85 degrees in trabecular bone. Conclusion: Instruments with a rough titanium surface show considerable angle-dependent differences in chip formation. In addition to bone density, the angle of the cutting edges should be taken into consideration during the placement of dental implants. Good results were obtained when the cutting edges were positioned at an angle of 65 degrees. This angle can have positive effects on osseointegration. Purpose: To evaluate the influence of administration of avocado/soybean unsaponifiables (ASU) on implant osseointegration in rat tibiae. Materials and Methods: Thirty rats were randomly assigned into one of three equal-sized groups: (1) ASU1: administration of ASU starting 7 days prior to implant placement; (2) ASU2: administration of ASU starting on the day of implant placement, and (3) CTL: administration of saline solution. In all animals, one titanium implant was placed in each tibia. All animals received ASU or saline solution by gavage daily until sacrifice 60 days postoperatively. Implant osseointegration and bone maturation were assessed by biomechanical and radiographic bone density analysis; descriptive histology; immunohistochemistry for bone morphogenetic protein 2 (BMP-2), transforming growth factor beta 1 (TGF-β1), and osteocalcin; and histomorphometric evaluation of bone-to-implant contact (BIC) and mineralized bone area fraction within the threads of the implant. Results: ASU1 and ASU2 showed three times higher expression of BMP-2 and nine times higher expression of TGF-β1 compared with CTL (P < .05). Histomorphometric analysis, however, showed that both ASU1 and ASU2 groups presented significantly higher BIC values only in the cortical bone compartment when compared to CTL (P < .05). Conclusion: ASU consumption seems to exert only a subtle effect on implant osseointegration. Taylor, Thomas D. / Klotz, Michael W. / Lawton, Rodger A. Worn particulate titanium abraded from a titanium dental implant that discolors the adjacent soft tissues has not previously been reported. Two cases of this gingival tissue "tattooing" are reported here. While the use of zirconia abutments in areas of high esthetic concern is widespread, the effects of particulate titanium being worn from the implant by the much harder abutment material and then taken up in the adjacent soft tissues should be considered as a potential complication and a consideration when selecting the type of abutment to be used. Purpose: This study investigated the combination of a bone marrow mononuclear fraction with a bone xenograft material in an appositional bone regeneration technique. Materials and Methods: Twelve New Zealand rabbits were randomly divided into two groups of six animals each. Bone reconstruction situations were created using titanium cylinders; these were filled with xenograft in group 1 animals and xenograft enriched with bone marrow mononuclear fraction in group 2 animals. Two cylinders were adapted onto the calvaria of each animal. Bone marrow aspirate was obtained from the tibia of every animal. After 8 weeks, the animals were sacrificed and the parietal bone and cylinders were fixed in 10% formalin for analysis of clinical measurement of the bone volume formed inside the cylinders and histomorphometric evaluation of parameters such as vital mineralized tissue (VMT), nonvital mineralized tissue (NVMT), nonmineralized tissue (NMT), and vital mineralized tissue in contact with titanium (VMTCT). Results: Clinically, groups 1 and 2 demonstrated bone volume gains of 88.29% ± 25.97% and 98.96% ± 0.00%, respectively. Histomorphometry for groups 1 and 2, respectively, demonstrated the following mean values: VMT, 18.96% ± 8.99% and 28.02% ± 8.76%; NVMT, 28.43% ± 2.44% and 25.57% ± 2.33%; NMT, 52.61% ± 10.80% and 46.42% ± 10.06%; and VMTCT, 4.98% ± 4.30% and 27.29% ± 9.58%. Conclusion: The results of this study suggest that the use of the bone marrow mononuclear fraction can improve bone healing and the level of osseointegration. Purpose: An implant abutment should be soft tissue-compatible and resistant to plaque accumulation, and it is preferable for an implant abutment to have color harmony with the surrounding tissues. This study aimed to compare the in vitro fibroblast cell attachment and proliferation on several abutment materials of different colors. Materials and Methods: A total of 240 specimens in 6 experimental groups were used: titanium alloy (SM [smooth machined]; gray), cobalt-chrome-molybdenum alloy (CCM; gray), titanium nitride-coated titanium (TiN; yellow), anodic-oxidized titanium (AO; dark pink), composite resin-coated titanium (R; white), and zirconia (Zr; white). The culture plate surface was employed as a control (C). The surface roughness (Sa ), developed interfacial area ratio (Sdr ), and water contact angle (WCA) were measured. The human gingival fibroblast (HGF-1) attachment and proliferation at the third and seventh days were observed. Results: Sa values of all experimental groups were < 0.5 μm. Sdr values were between 5% and 8%, except for the Zr group (0.06%). WCA of all groups was greater than 40 degrees. More HGF-1 cells attached on the surfaces of the SM, TiN, and Zr groups than the C group, and the least number of cells were observed on the CCM group (P < .001). On the third day of proliferation, the C group showed significantly greater proliferation than all experimental groups (P < .001). On the seventh day of proliferation, the TiN, AO, Zr, and C groups exhibited twice the number of cells compared to the rest of the groups (P < .001). Conclusion: Within the limitations of this study, zirconia abutments would be the best choice in the anterior region. Titanium nitride-coated titanium alloy abutments or anodic-oxidized titanium alloy abutments might also be good choices in areas of esthetic challenge or under high occlusal loads. Purpose: Maxillary sinus floor augmentation is a treatment that has been proposed for patients in whom the alveolar bone height is insufficient. This procedure is commonly used in patients aged 40 to 70 years and older. However, little information exists whether the factor of age might influence the outcome of augmentation procedures. The aim of this study was to investigate whether the patient's age has an effect on bone formation and incorporation in maxillary sinus floor augmentation procedures. Materials and Methods: A fully synthetic nanocrystalline bone augmentation material (NanoBone, Artoss) was used for sinus floor augmentation in patients with a subantral vertical bone height of at least 3 mm and maximum of 7 mm. After 7 months healing time, biopsy specimens were taken and were divided into two groups according to the patient's age. Exclusion criteria were poor general health (eg, severe renal/and or liver disease), history of a radiotherapy in the head region, chemotherapy at the time of surgical procedure, noncompensated diabetes mellitus, symptoms of a maxillary sinus disease, active periodontal or systemic diseases, smoking, and poor oral hygiene. Histologic analyses with hematoxylin-eosin stain were performed. Multinucleated osteoclast-like cells were identified by histochemical staining (tartrate-resistant acid phosphatase [TRAP]). Quantitative and age-dependent assessment of bone formation, residual bone grafting material, and soft tissue formation following sinus augmentation was performed using histomorphometric analysis and the Bonferroni adjustment of the Student t test. Results: Twenty biopsy specimens from 17 patients were taken and divided into two groups according to age (group 1: 41 to 52 years; group 2: 66 to 71 years) containing 10 specimens each, which were analyzed in triplicate resulting in a total of 30 specimens per group. A regeneration process with varying amounts of newly formed bone surrounded by marrow-like tissue was present in all augmented regions. No signs of inflammation or immune reactions were visible. Residual particles of the augmentation material could be observed within the specimens. An age-dependent difference in investigated parameters between the two age groups could not be documented. Conclusion: The histologic examinations confirm that the fully synthetic nanocrystalline bone augmentation material used in this study is biocompatible and allows maxillary sinus augmentation in patients aged 41 to 70 years.